If you've upgraded to Windows 8, and are doing anything with dual monitors, you may have seen that little stripe visible at the bottom of your second monitor. If you're in auto-hide mode with the Toolbar, mousing over it brings it up. If not, it just stays there on both screens. While this may be a nice idea if you're running dual monitors on your standard work desktop, it's certainly not ideal for use in Trial Presentation. Nobody wants to see which apps you have open, or a little stripe on the bottom of the display. Worse yet, if you happen to get an alert, it begins flashing. Not pretty during trial. So, how do you set this properly? I like to set the Toolbar to auto-hide so I can get more screen real-estate. Even with today's larger monitors, more is better. 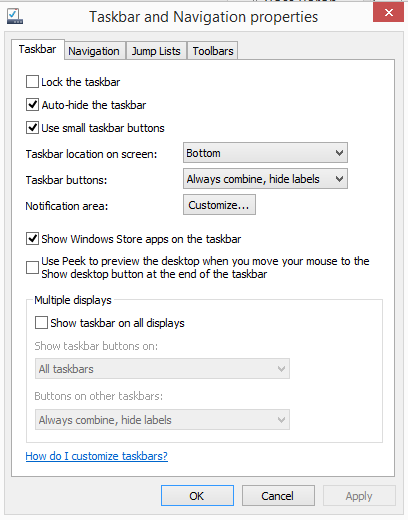 You can deselect the default setting, enabling Toolbar display in both monitors (Show toolbar on all displays).